Canada’s largest private-sector union, Unifor, seeks to represent Toyota plant workers in Cambridge and Woodstock. 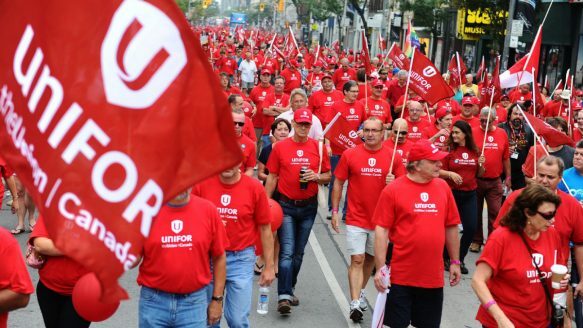 Members of Unifor, Canada's largest private-sector union, march in Toronto's annual Labour Day Parade in September. Unifor is seeking the right to represent more than 6,500 autoworkers at Toyota's Canadian assembly plants in Cambridge and Woodstock. The country’s largest private-sector union is seeking the right to represent more than 6,500 autoworkers at Toyota’s Canadian assembly plants in Cambridge and Woodstock. If successful, the plants would become the first Toyota assembly plants in North America to have union representation, a major victory for the labour movement as its traditional base — U.S.-owned auto plants — continues to shrink. Unifor will announce Monday it is applying to the Ontario Labour Relations Board to become the official bargaining agent for Toyota Motor Manufacturing Canada. Toyota workers will be asked to vote, likely next week, on whether they want to be represented by Unifor, the union formed by the merger last year of the Canadian Auto Workers and the Communications, Energy and Paperworkers Union. To succeed, 50 per cent plus one of Toyota workers must vote yes. “I’ll be watching very closely. It’ll certainly be noteworthy given the UAW’s recent loss at Volkswagen,” said Kristin Dziczek, a labour analyst with the Center for Automotive Research in Ann Arbor, Mich.
She’s referring to the narrow defeat in February of a vote that would have brought the United Auto Workers in to represent Volkswagen workers in Chattanooga, Tenn. The union has partly blamed some Republican state legislators, who they say threatened to withhold future tax incentives if the plant unionized. While Toyota wouldn’t be the first “foreign” automaker in North America to unionize, it would be one of the few outside of the big three U.S.-owned automakers — General Motors, Ford and Chrysler. “It would be a major change, for sure,” said Tony Faria, a professor in the University of Windsor’s Odette School of Business, noting the culture at Toyota is built on managers sharing the same cafeteria and parking spots as the front-line employees. The call for a vote comes more than a year after workers at the Toyota plant launched an organizing drive, citing concerns about the extensive use of contract employees and unilateral changes in working conditions and benefits. Last year, Toyota announced new hires would be enrolled in a defined contribution pension plan, which doesn’t provide the kind of guaranteed payouts that older workers in its defined benefit plan will get. Carmen Nixon, 30, of Paris, Ont., says she started on contract at Toyota in 2010 but didn’t land a permanent job until 2013. Temporary employees have no job security and don’t get the same benefits as full-time staff, she said. Lee Sperduti, 36, of Cambridge, has been a Toyota employee for 11 years. “It’s mostly about policy, fairness, human-rights issues, health and safety issues, treatment of contract team members, that kind of stuff,” he said. Unifor national president Jerry Dias says the whole Canadian auto industry stands to benefit from the unionization of Toyota. One of the biggest arguments against unionizing is the fear Toyota would pull out of Canada. Dias said that’s not going to happen. Industry experts agree it’s unlikely given the huge investment the company has made here. However, some question whether the company would continue to expand in Canada. Toyota says it sees no need for its workers to unionize. “We don’t think a union is necessary. We have all the programs, policies and procedures in place that ensures there’s a culture of mutual respect in Cambridge and Woodstock,” said company spokesperson Greig Mordue. Unlike the Detroit Three, Toyota has never laid off any permanent workers, Mordue noted. Since opening its first plant 25 years ago, production in Canada has grown to half a million vehicles last year. “We can understand why Unifor would want to be part of this. We just don’t believe they have anything to offer,” Mordue said, noting union dues would take $6 million out of workers pockets. Unifor estimates Toyota earned $1 billion in profit out of the Canadian market last year, in combined production and vehicle sales. Toyota Motor said it doesn’t break out its earnings. “Certainly, in manufacturing, we weren’t anywhere near that,” Mordue said. The company assembles the Corolla, Matrix and Lexus RX350 models in Cambridge and the RAV4 in Woodstock. More than 40 per cent of Toyota employees at the two plants have signed union cards, a legal requirement before a certification vote can be held, the union said earlier this year.